And that is without mentioning the various session papers being presented by up and coming MacDonald scholars. This really is something not to be missed! If you have already booked then thank you and joining instructions together with a detailed programme will be going out in the next day or two. 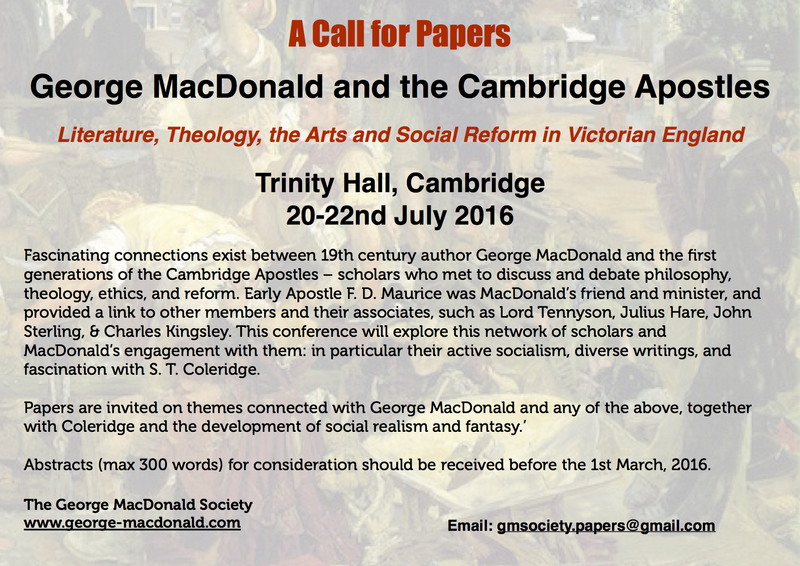 I have updated the booking form for the Cambridge Conference on the web site (www.george-macdonald.com). The big news is that I can now confirm Timothy Larsen from Wheaton College, as one of our Keynote speakers. Alongside Stephen Prickett, Kerry Dearborn and Elisabeth Jay this is an exciting lineup already! You will note the 10% early bird discount if you book by 1st April, 2016. Booking early helps our planning. Ron Dart on George MacDonald’s influence on C. S. Lewis. See the video here. On Saturday, 2nd May 2015 a plaque will be unveiled at one of George MacDonald’s homes in Hastings. The plan is to meet at Wellington Square at 2:30pm from where we will walk to the house. The unveiling will be preceded by a few words from our President, Professor Stephen Prickett and followed by a short guided walk (about an hour or so) led by Edward Preston and tea afterwards. Here is a link to the article, “Would We Have Been Friends”: Piper/Keller contra Lewis/MacDonald” by Ron Dart. The idea that people will know that we are Jesus’s disciples by the love we have for one another (John 13:5) is a challenging thought. Particularly in a context (such as this), where we disagree profoundly with what that person is saying. There is a natural tendency to confront them head on. What strikes me about both Lewis and MacDonald is the breadth of their reading. It seems to me they were able to distil the positive in disparate positions and make it their own without getting sidetracked into dispute. A book I’m reading talks about how we like to stay within our intellectual boxes (a limitation) but that our times of growth are when we are taken outside that box and have our safe view of the world challenged, letting fresh light into the dusty room.